Two weeks ago, a colleague of mine left the island for good. She did not renew her contract with our company and just went back home to China. We weren’t really very close friends but she’s one of my favorite colleagues. We used to swim and snorkel together. She’s one funny girl. A bit naive too. We said let’s stay in touch when she left, but I’m not sure if she’ll do. They all say this when they leave, but only some of them will do. They will keep in touch initially until slowly by slowly they will be busy with their new lives and the connection will eventually fade away. For a person like me living and working overseas for 11 years, this occurrence is quite normal. People come and go. Some might become my friends, a lot will be not. I tried to recall the people I have worked and lived with in the past decade and out of that, how many are my friends. Out of maybe 500 people, 3 have become my real friends to whom I am constantly in touch with and maybe 2 to 3 more who are usually on stand by mode, mostly quiet and invisible but are definitely there if you need them. A huge percentage of that 500 are probably on my facebook friends list, those who will like a newly uploaded picture of mine from time to time and that’s about it. Out of those, less than 10 have really become my friends in and out of facebook. A lot of those previous colleagues and acquaintances have once become very close to me. A lot of them are huge part of my memories, good and bad. A lot of them are part of who I am today. However, no matter how many friends have I gained, one by one, they all leave. No matter how close I was with some of them, we all grew older and we all grew apart. We went on separate ways and all that is left now are good old memories that we might laugh at in case a reunion happens, or in case someone opens up a facebook group chat that may stir up some excitement for a few days but will also die down as soon as the stories run out. As years pass by we collect acquaintances, friends, experiences, stories and memories. But as we grow older, people leave and memories fade away. People walk out the door and go on their own ways. And sometimes like them, some memories and stories also leave us. They become like fog in our minds, a thin cloud of unclear thoughts as we age. They become like shadows following us but we don’t usually see or particularly pay attention to until one day they are completely forgotten. They are like treasures you hide in a box that you start to forget because you have kept them hidden for so long. 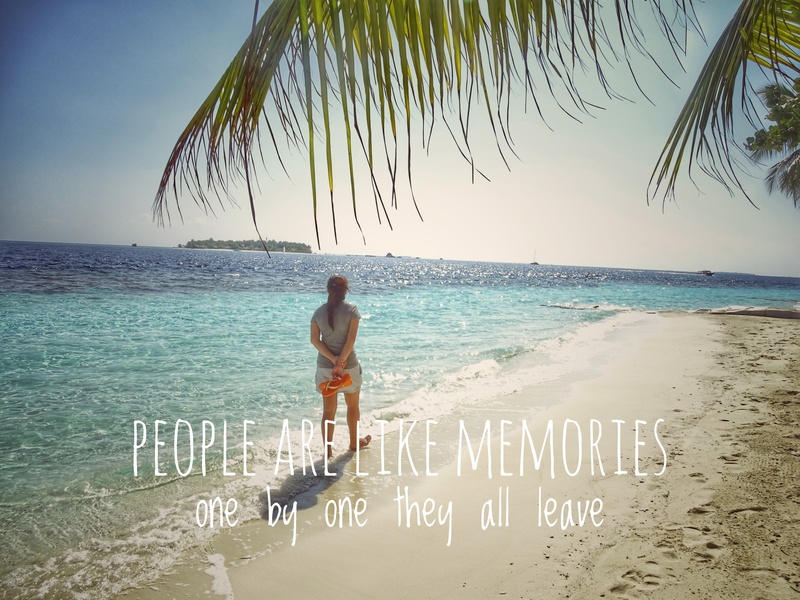 People are like memories. As we grow older, one by one they all leave. Yes bes, naalala ko tuloy si friend ni hindi man lang ako chinachat na. Hahaha. Ah, that’s life my friend. Sometimes, people disappear right away without warning or without leaving a trace, even after you hear them promise forever. People move on, feelings change. Meron nga, konting-konti na lang. Hahaha! Ang daming reply. Pa-delete na lang ng duplicates, including thise. Thanks! Dama kita. At first akala natin unthinkable ung makakalimot cla, pero tanggapan na nga lang kasi hindi na tayo ang ‘present’ sa kanila. Seize the moment ika nga, habang anjan pa.
Well, ganun talaga. The only constant thing in the world is change. Aw. I know how you feel. Sometimes it’s sad especially when you’re attached to the person. Eventually the distance will take its toll. But I think that’s the beauty of true friendship. No matter the distance and time you’re apart, you remain friends. And those who really want us in their lives will find a way to keep us no matter what. Hey thanks for passing by! Huhu wala nang time mag-blog! Salamat Aysa sa pagsali sa inyong bloggers’ group!! 🙂 Korek ka dyan sobrang busy ng buhay!